Beautifully handmade, Light weight, Citrine and Lava stone necklace with earrings. These stones combine for success and abundance. 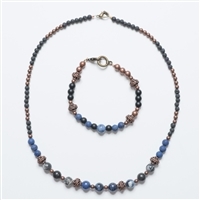 The stones in this set; Dark Sodalite, Lapis Lazuli, Peridot and Lava work together to combat migraine headaches when worn. Dark Sodalite creates inner peace. Lapis Lazuli is known as the “Migraine stone”. Peridot relieves stress, brings prosperity and is said to shield and protect your body. Lava comes from raw energy which stimulates re-birth. Use with essential oils to create a diffuser piece.